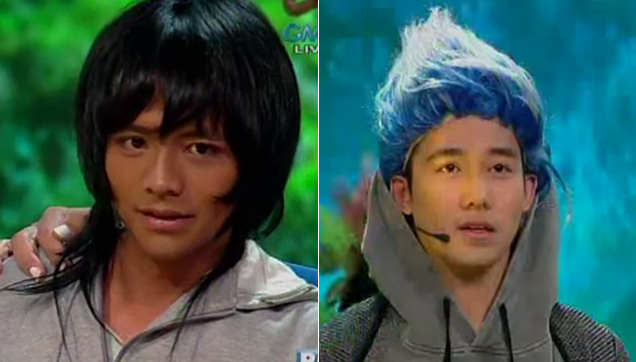 Carrot Man (Jeyrick Sigmaton) turned into Carma (Ken Chan) by Punita (Ai Ai delas Alas). It is also the first show to test Carrot Man's acting skills. Carrot Man, whose real name is Jeyrick Sigmaton, is the 21-year-old whose photo was made famous by Edwina Bandong as it went viral. In the video, Punita ordered her minions to capture someone who she will turn, once again, into a villain. She said she wanted someone strong so whoever they captured should eat plenty of vegetables so they captured Carrot Man. Punita then used her magic and turned Carrot Man into CarMa played by "Destiny Rose" star Ken Chan. CarMa, complete with striking blue hair and villainous getup, had the power to make people into statues. Watch the hilarious episode and see for yourself how Carrot Man faired on his first acting stint on TV!